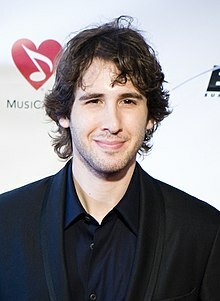 Joshua "Josh" Winslow Groban (born February 27, 1981) is an American singer, songwriter, actor, and record producer. His first four solo albums have been certified multi-platinum, and he was charted in 2007 as the number-one best selling artist in the United States, with over 22.3 million records in the nation. As of 2012, he has sold over 25 million records worldwide. Groban was born in Los Angeles, California, to Lindy (née Johnston), a school teacher, and Jack Groban, a businessman. Groban's younger brother, Chris, was born on Groban's fourth birthday. Groban's father is a descendant of Jewish immigrants from Poland and Russia, and he converted from Judaism to Christianity upon marrying Groban's mother. Groban's mother's ancestry includes English, German, Norwegian, and Jewish. His parents are Episcopalians. Groban first sang in public when he was in the seventh grade. His music teacher chose him to sing a solo of "S'wonderful" at the school's cabaret night, where he sang alone on stage for the first time. At this time, he was more focused on acting, playing Tevye in his high school's production of Fiddler on the Roof. In the summers of 1997 and 1998, he also attended the Interlochen Center for the Arts Camp in Michigan, majoring in music theater, and began taking vocal lessons. He went on to attend the Los Angeles County High School for the Arts as a theater major and graduated in 1999. He was admitted to Carnegie Mellon University, intending to study drama, but he left four months into his first semester after being offered a recording contract and deciding to pursue his singing career. In late 1998, the 17-year-old Groban was introduced by his vocal coach, Seth Riggs, to Grammy-winning producer and arranger David Foster and future manager Brian Avnet. [not in citation given] At the time, Groban had no recording experience and was preparing to begin studying at Carnegie Mellon University. Groban worked for David Foster as a rehearsal singer on a series of high-profile events, including the January 1999 inauguration of Gray Davis as Governor of California and the 1999 Grammy Awards where—as a stand-in for Andrea Bocelli—he rehearsed Foster's "The Prayer" with Céline Dion. According to manager Avnet, Groban was very nervous about standing in for Bocelli and had to be talked into it, but his performance prompted the show hostess, Rosie O'Donnell, to ask him to appear on her show the following week, which then led to an appearance on Ally McBeal. Creator David E. Kelley created character Malcolm Wyatt for Groban in the season finale aired in May 2001. The character of Malcolm Wyatt was so popular, prompting 8,000 emails from viewers, that Groban was asked to return the next season to reprise his role and perform "To Where You Are." Avnet claims this sequence of events effectively got Groban's career off the ground. Two months after Closer was released, it rose on the Billboard charts from number 11 to number one. Groban's cover of "You Raise Me Up" became his third most popular song on the adult contemporary charts as of 2002. 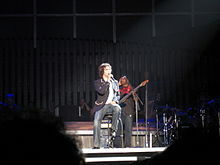 Groban also performed the song "Remember" (with Tanja Tzarovska) on the Troy soundtrack, "Believe" on the soundtrack to the 2004 animated film The Polar Express and a cover of Linkin Park's "My December". Since October 18, 2016, Groban has been performing on Broadway as Pierre in Natasha, Pierre & The Great Comet of 1812, an electropop opera by composer Dave Malloy based on War and Peace. For his performance as Pierre, Groban has been nominated for the 2017 Tony Award for Best Actor in a Musical. He is scheduled to leave the cast after the performance on Sunday, July 2, 2017. Groban also performs the song "Evermore" for the end credits of the 2017 film Beauty and the Beast. Various music critics have described Groban's voice in different ways, with some referring to him as a tenor and others as a baritone. In performance, Groban's music goes as low as G2 (as in the songs "To Where You Are" and "Higher Window") and extends up to at least B♭4 (as heard in "You Raise Me Up" or in "February Song"). This places his voice lower than the tenor range on the low end, and just short of tenor C, and therefore above the baritone range, on the high end. ^ DeGrasse Tyson, Neil. "The Science of Music with Josh Groban". Startalk. Retrieved 10 June 2015. ^ "Monitor". Entertainment Weekly. February 22, 2013. ^ Grein, Paul (July 8, 2014). "Top 20 New Acts Since 2000". Yahoo! Music. ^ "Gold & Platinum – March 12, 2011". RIAA. Retrieved 2011-03-12. ^ "Josh Groban sings his way into the hearts of festival crowd". Napa Valley Register. ^ a b Gurewitsch, Matthew (July 28, 2002). "MUSIC; The New Boy Wonder of the Voice". The New York Times. ^ "Josh Groban: Biography". Answers.com. ^ a b c "Bio". AJT Enterprises. Joshgrobanlive.com. April 12, 2008. ^ "Josh Groban Biography". Tvguide.com. 1981-02-27. Retrieved 2011-03-12. ^ a b c "Josh Groban Biography". Joshgroban.com. ^ "That Josh Groban Guy". That Josh Groban Guy. Retrieved 2011-03-12. ^ Thrills, Adrian (January 5, 2007). "The popera boy struts his stuff". Daily Mail. London. ^ a b "Dave 'Til Dawn". Groban Archives. 2002-12-13. Retrieved 2011-03-12. ^ a b c d "Josh Groban – Biography". Biggeststars.com. Retrieved 2011-03-12. ^ Cidoni, Michael (January 21, 2008). "Josh Groban to sing at Sundance festival". USA Today. Retrieved May 7, 2010. ^ "Josh Groban article". Grobanarchives.com. 2006-11-07. Retrieved 2011-03-12. ^ "Megan Smolenyak: 10 Things You Didn't Know About Josh Groban's Family Tree". Huffingtonpost.com. 2011-10-18. Retrieved 2012-01-11. ^ "That Josh Groban Guy". That Josh Groban Guy. Retrieved 2014-05-23. ^ a b c d e "Interview with Brian Avnet". HitQuarters. 16 Feb 2004. Retrieved 21 Dec 2010. ^ a b c "Official Josh Groban site". Joshgroban.com. Retrieved 2011-03-12. ^  Archived October 15, 2006, at the Wayback Machine. ^ Ruhlmann, William "Josh Groban > Biography". allmusic. Rovi Corporation. ^ "Nominees & Winners for the 77th Academy Awards (2005)". Academy of Motion Pictures Arts and Sciences. Retrieved 2012-01-19. ^ The Polar Express Grammy Awards AllMusic.com. Retrieved 19 January 2012. ^ "New Album Illuminations – Coming Soon! | Official Josh Groban". Joshgroban.com. 2010-09-01. Retrieved 2011-03-12. ^ a b "Josh Groban Dishes On His New Album & Love Life | Access Hollywood – Celebrity News, Photos & Videos". Access Hollywood. 2010-11-12. Retrieved 2011-03-12. ^ Groban, Josh. "Hidden Away". Amazon.com. ^ "New Song "Voce Existe Em Mim" Available on iTunes Now | Official Josh Groban". Joshgroban.com. 2010-10-11. Retrieved 2011-03-12. ^ Stewart, Allison (November 16, 2010). "'Illuminations': Josh Groban is still a swell guy". The Washington Post. ^ "Undercover News: Josh Groban Plans More Records With Rick Rubin". Undercover.fm. 2010-12-29. Retrieved 2011-03-12. ^ "Josh Groban Announces 2011 "Straight To You" World Tour" (Press release). Marketwire. 14 February 2011. Retrieved 9 March 2011. ^ "News". HITS Daily Double. 2013-02-12. Retrieved 2014-05-23. ^ "Album Cover, Title, & Release Date! | Official Josh Groban". Joshgroban.com. 2012-11-18. Retrieved 2012-12-26. ^ "Triangle Music: Josh Groban announces orchestral summer tour, show with NC Symphony". Trianglemusic.blogspot.com. 2014-03-21. Retrieved 2015-05-03. ^ "Josh Groban - Timeline Photos". Facebook.com. Retrieved 2015-05-03. ^ "''Noël''". Josh Groban. 2007-11-20. Retrieved 2011-03-12. ^ Mayfield, Geoff (December 18, 2007). "Groban's 'Noel' Makes Chart History". Billboard.biz. ^ "Chess In Concert". Retrieved May 10, 2011. ^ "Royal Variety Performance 2008: all-star line-up unveiled for 80th anniversary show on BBC One". BBC Press Office. BBC. 2008-11-17. Retrieved June 1, 2009. ^ Daunt, Tina (2009-01-17). Daunt, Tina (2009-01-17). "Inauguration revelers have plenty of events to choose from". Los Angeles Times. Retrieved 2009-01-17. ^ Schwartz, Alison. "Seth Meyers: Should He Join Kelly Ripa on Live!?". Time Inc.
^ Marcus, Bennett. "Josh Groban Says Doing Live! With Kelly Ripa Is More Fun Than Many Things He's Done in the Past". Condé Nast. ^ "Josh on the Glee Season Finale - Official Josh Groban". Joshgroban.com. Retrieved 2012-01-11. ^ "Josh Groban appearing on 'The Office' as Andy's brother". Entertainment Weekly. 18 August 2011. ^ "Crazy, Stupid, Love Cast and Actor Biographies | Movie Cast and Credits". Tribute.ca. Retrieved 2011-03-12. ^ Chinen, Nate (November 11, 2010). "Josh Groban's Album 'Illuminations'". The New York Times. ^ "Josh on CSI NY". 23 January 2013. ^ "CTV News | News Video - Top National News Headlines - News Videos". Ctvnews.ca. Retrieved 2014-05-23. ^ Nguyen, Vi-An (26 September 2013). "Sarah Michelle Gellar: 'To My Kids, Robin Williams Is Uncle Robin'". Parade. Retrieved 11 April 2014. ^ Schmitt, Brad (1 April 2014). "Josh Groban Hates Brad Paisley on New Episode of 'The Crazy Ones'". Country Weekly. Retrieved 11 April 2014. ^ "Josh Makes Cameo In Muppets Most Wanted | Official Josh Groban". Joshgroban.com. 2014-03-12. Retrieved 2014-05-23. ^ "Groban leads U.S. pop charts in slow sales week". Reuters. 2007-12-05. Retrieved 2015-05-03. ^ "That Josh Groban Guy". That Josh Groban Guy. Retrieved 2015-05-03. ^ "Josh Groban's "Full-Circle Moment"". CBS News. 2008-02-08. Retrieved 2015-05-03. ^  Archived January 2, 2007, at the Wayback Machine. ^ "Josh Groban "You Raise Me Up" Sheet Music - Download & Print". Musicnotes.com. Retrieved 2015-05-03. ^ "IPA Source Baritone". Ipasource.com. Retrieved 2015-05-03. ^ Gurewitsch, Matthew (July 9, 2008). "MUSIC; The New Boy Wonder of the Voice". The New York Times. Retrieved 2015-05-03. ^ "Twitter / joshgroban: A baritone with some high notes". Twitter.com. Retrieved 2014-05-23. ^ "Josh Groban: Charity Work & Causes". Look to the Stars. Retrieved 2015-05-03. ^  Archived May 18, 2008, at the Wayback Machine. ^ Started By (2004-09-02). "Josh Groban Says Thank You to Fans". Joshgroban.yuku.com. Retrieved 2011-03-12. ^ Mwanza, Nyaka (April 12, 2013). "Josh Groban, Sophia Bush, Hunter Biden and Debi Mazar & Gabriele Corcos Commit to Live Below the Line". World Food Program USA. Retrieved April 26, 2013. ^ "Josh Groban". Little Kids Rock. Retrieved 2015-05-03. ^ "Josh Groban (Host)". ABC.com. ABC. Retrieved 3 September 2014. ^ "On the Brink of Stardom: Josh Groban live Internet chat on ABCNEWS.com". Olografix.org. 1999-02-22. Retrieved 2011-03-12. ^ "Josh Groban Lands Spot on People's 'Most Beautiful' List". Fox News. 2008-05-06. Retrieved 2015-05-03. ^ "Josh Groban First Solo Tour" (Press release). New York City, New York: Reprise Records. Business Wire. November 7, 2003. Retrieved March 26, 2017. ^ "Josh Groban's AWAKE Tour Returns to U.S." (Press release). New York City, New York: Reprise Records. Marketwired. June 8, 2007. Retrieved March 26, 2017. ^ Sinkevics, John (February 28, 2011). "Josh Groban brings 'Straight to You' tour to Grand Rapids in August". The Grand Rapids Press. Advance Publications. Retrieved March 9, 2011. ^ "Josh Groban Announces "In The Round" North American Tour To Kick Off October 2nd" (Press release). PR Newswire. May 6, 2013. Archived from the original on September 28, 2013. Retrieved September 28, 2013. ^ Kuchik, Natalie (April 16, 2015). "Josh Groban announces North American tour dates for the fall of 2015". AXS News. Anschutz Entertainment Group. Retrieved March 26, 2017. ^ "Last Chance To Enter All That Echoes Symphony Tour Sweepstakes". Josh Groban Official Website. Reprise Records. July 26, 2013. Retrieved March 26, 2017. ^ "Singer Josh Groban To Perform In Philadelphia This Fall". WOGL. CBS Radio. April 21, 2015. Retrieved March 26, 2017. ^ Burke, David (May 26, 2011). "Josh Groban breaks perfectionist ways for tour, CD". Quad-City Times. Lee Enterprises. Retrieved March 26, 2017.